Wanted to share some measurement data for the cut springs. There are 12 springs in the MicMix MasterRoom XL-305 and my clone. Shown below are the actual measured delay and approximate length of the spring at rest. For springs which are coupled in the middle (>18ms) there are two measurements and a total. The portion of the spring in the middle which is not coiled is not included in measurement. 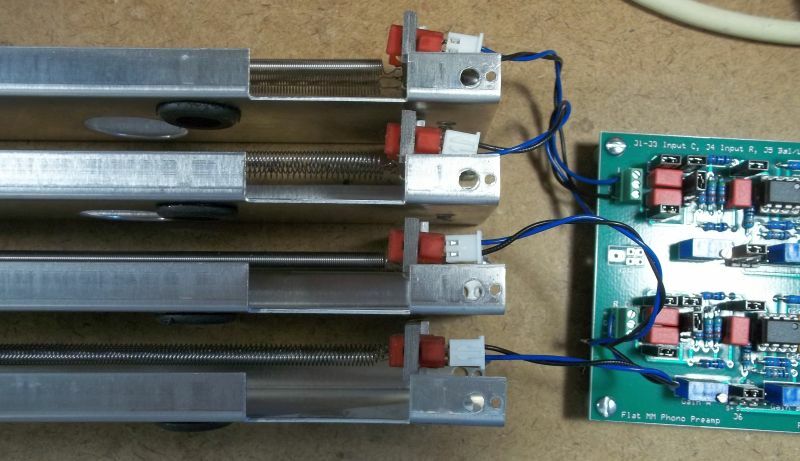 The coupler on these springs is randomly offset from the middle based solely on superstition. The total length of the coiled section is what matters. The odd numbered lines are assigned to the Left channel. 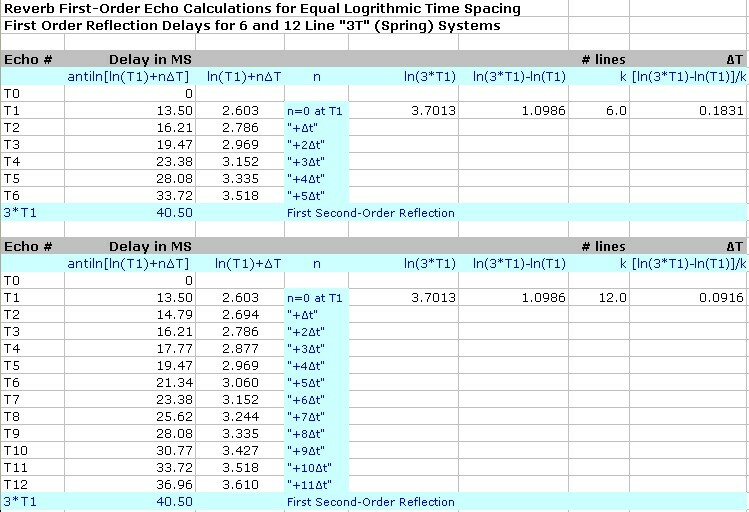 The longest line, T12, was also cut, IIRC the delay for an Accutronics" "Long" spring is 37.40 ms.
To avoid an early onset of insanity I only turn-counted the first line after measurement. For the remaining lines I estimated the length and rough cut them a few turns long one at a time. I then measured each line using my home-brew TDR and cut the final length using 53 µs per turn as an estimate. I took the average of each line's final ms/inch and it averages out to 3.8 ms per inch. 254 turns is 3.54" long which works out to be 71.75 turns: The tooling is undoubtedly 72 turns per inch. 3.8 ms/72 turns is 52.78 µs per turn. When cutting springs remember that they're stainless steel and very hard. Wear eye protection and use the same pair of diagonal pliers that you'd use to cut guitar strings. They will destroy good cutters. Be very careful when forming the hook that you don't stick the sharp end of the uncut spring into your finger. I initially wired the drive coils as 4Ω so I could experiment with a "simulated" current source using a large value resistor which, according to Accutronics, should be 5X the coil 1 kHz impedance. I experimented with 10-47Ω. Though lossy it does approximate constant current well and has a huge effect on tonal balance. Though it cuts the low end sufficiently it didn't sound as clean as unequalized "zero Ohm" voltage drive. Like jlm years ago I'm also beginning to think damping is a factor. Rather than build a true current drive I decided to try equalized zero Ohm voltage drive. I re-wired the two driver transducers in series to achieve 16Ω impedance. I like it much better - at the moment I'm using a combination of "constant current" and "constant voltage" in the form of a single-order highpass filter with a -3dB point around 700 Hz. Above 700 Hz it switches to constant voltage drive. A Tilt EQ on the driver with a limited +/-range on the low end and a larger range on the top end might be useful. I decided to try 0Ω voltage drive with the transducers wired for 16Ω. The following are the output with pink noise driving the "chamber." The first curve is with no high pass filter. The transducer is inductive: Drive current falls at a 6 dB/octave rate. The output, not coincidentally, also falls at -6dB/octave between about 100 Hz to 4 kHz. I went with the third flatter option which has a 6dB/octave HP slope in the driver response beginning around 1500 Hz. This provides a constant-current-like response in the bass region and a constant voltage response above 1500 Hz. Though I could have pushed it up a bit to to flatten response I was concerned that the bass might sound too thin. Note the dip and peak between 6-8 kHz. This is the direct feed-through that I talked about earlier. In the XL-305 I used a third order LP filter to "calm down" the rising response of the true current-source output and prevent direct feed-through. I honestly think that the voltage drive 0Ω output's damping provides a little cleaner reverb. Coming up next: More sound files. The driver needs a low pass filter to prevent the "direct" through-the-spring non-torsional HF leakage that we see in the response curves above 5 kHz that were previously-posted. You can occasionally hear it on HF transient attacks as an undelayed (sort of) "swishing" sound. Think of it as a "skin effect" of sound flowing through wire. My hunch is that at high frequencies some of the torsional rotation gets converted to longitudinal which skips over the spring turns with the spring acting as a solid rod. Since there's no useful output from the "room" above 5 kHz it makes sense to filter it in the driver. Special thanks to The Dave Matthews Band, Eric Johnson, Billy Joel and Susanna Hoffs. Very cool to see that you're back on this project. I'm learning a lot reading these posts. I'm working on a mounting method for the "sleds" and wanted to find the best hum-bucking configuration. MasterRoom XL-305 Clone Sleds, Pickup End. As expected they hum-buck very well. You can see the pickup polarity reversal in the photo above. The drive will also be reversed to compensate and maintain absolute polarity. With the ambient hum field on the bench the 60 Hz spur nulled about 20-30 dB. I'll be making four L-brackets from aluminum extrusion about 3-3/4" long and use the large mounting holes to mount each sled to the bracket. It looks like 7/8" spacing between sleds allows enough clearance. The sections will be hard-mounted to each other with the L-brackets tying them together. The L-brackets will be used to suspend the sled assembly, perhaps with O-rings, in a frame. I envision the whole thing will look like a microphone shock mount. I should add that I've been able to get a hold of the MR-II/III/IV service manual, thanks to a gracious Australian. Here it is! That schematic brings back a lot of memories. I think those samples sound really good, very useful. Today I'm making some L-brackets to hold the four sleds together.